Lolena Nicholas has served as a Mānaleo Resource for for Kawaihuelani, since 2006. 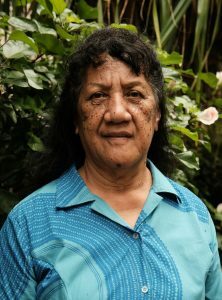 Prior to coming to the University of Hawaiʻi, Lolena worked as a teacher at Hawaiʻis first immersion revitalization program, Pūnana Leo Preschools from its inception in 1983. The students in Hawaiian language meet with mānaleo weekly as a class requirement to practice their speaking, pronunciation, reading, and listening skills. Lolena structures the time she spends with the students in a way that will strengthen their worldview through speaking, listening, and thinking from a Hawaiian perspective. Even while teaching, Lolena maintains a strong connection to community efforts to revitalize the Hawaiian language. She has served as a co-host for Ka Leo Hawaiʻi, a Hawaiian language radio talk show for KCCN and is involved with Aʻo Mākua, a distance learning opportunity for parents and children to reconnect with and through the Hawaiian language and culture.